Top-law-schools.com appreciates Kevin Johnson, Dean of the University of California Davis, School of Law (King Hall), for kindly taking the time to answer some questions. Kevin Johnson: Please let me preface my answers to this interview by saying this: UC Davis, a young law school by law school standards, is on the move. We are moving up in the rankings and, in a matter of a few years, will be in the top 25 of all law school rankings. Our faculty are made up of internationally-renowned scholars, who publish in the best law reviews in the country, and also advise the Liberian government, U.S. Department of State, and the Obama administration. Attend a scholarly conference at Harvard, Yale, Stanford, and UC Berkeley and you will likely see a UC Davis School of Law faculty member participating. Besides being exposed to academic and teaching excellence, students who come to UC Davis join a true intellectual and social community. This is a different kind of law school, with a faculty and administration committed not only to research but to students as well. It probably sounds like I am a hometown fan. I am. But, ask around, and I am confident that you will hear that something extraordinary is going on at UC Davis School of Law. TLS: How would you describe the ideal candidate for King Hall? Like all great law schools, we, of course, care about strong academic credentials. That means high grades and LSAT scores. But there are qualitative measures that are awfully important as well. You will really get the Admissions Committee’s attention if you can demonstrate that you are dedicated, ethical, intellectually curious, and ready to learn—as well as an interesting person! We also favor students who are leaders, and in that sense, depth of involvement in professional or extracurricular activities is important as well. We admit many different kinds of students. Some have a demonstrated public interest commitment, while others plan to pursue a joint JD/MBA or practice at a law firm. Some come from a family of lawyers, while others are the first in their family to go to college (like me, by the way). Our students’ academic interests range from international law to intellectual property to civil rights, business to environmental law. We are not seeking any kind of ideal candidate as much as we are trying to put together a well-rounded student body. I urge applicants to be themselves, not try to be the “perfect” law school applicant. Just as there are many kinds of outstanding legal professionals, there are many ways to be an attractive law school applicant. Perhaps most importantly, UC Davis School of Law reviews each and every application individually. We do not employ GPA or LSAT cutoffs. We take personal statements most seriously and, and after reviewing the entire files, seek to admit the best-and-brightest students. Within the constraints of the law, we each year seek to admit a class that reflects the socioeconomic and other diversity of the state of California and the nation as a whole. TLS: Do you have any advice for students preparing to apply to law school? What about for admitted students to prepare for their first year at UC Davis? Obviously, great grades and test scores suggest that you are a dedicated and accomplished student. But the Admissions Office at UC Davis School of Law wants to get a sense of how you apply your academic talents, so I would urge you to take the personal statements and letters of recommendation most seriously. Your personal statement is particularly important to us. In many cases – and in every case when we start admitting students from the waitlist – every single person on the admissions committee, including the Associate Dean, reviews the personal statements. Some hints? Please, please, please do not write what you think we want to hear. Instead, write about who you really are. Highlight unique experiences, professional or personal. Tell us about challenges that you have overcome. Let us know about special talents and achievements, such as speaking languages other than English or your experience as a classical pianist. Keep in mind that our goal as a law school is to assemble a class of the highest quality that also reflects diversity of thought, background, and experience. Last but not least, remember that your personal statement is a sample of your writing, so your writing skills, including basics like grammar and punctuation, will be examined carefully. Obtain letters of recommendation from people who know you well and can speak in detail about your best intellectual and personal qualities. Do not choose a recommender based on title alone. Letters from high-powered politicians who you never met, for example, are not particularly persuasive. But letters from your professors who know you and your abilities can be compelling. Every year, we admit students from a full range of majors, from Engineering to Chicana/o Studies, Biology to Math, History to Music. There is absolutely no ideal pre-law major, but many successful law students have a feel for history, economics, political science, sociology, and writing and literature. If you did not major in these subjects, it might be helpful to take some of those classes to ensure that you have the proper foundation for a legal education. Come in well-rested and with an open mind. Don’t read books about substantive law before starting law school, because they will be very difficult to follow and you will get frustrated (and sometimes misled). But reading non-technical books about the legal system can be helpful as you prepare to begin your legal studies. Bob Woodward’s The Brethren and Jeffrey Toobin’s The Nine come to mind. Take Scott Turow’s One L and the film “The Paper Chase” (as well as “Legally Blonde”) with a grain of salt! That is not what life is like at UC Davis. TLS: What do you consider to be the most important factors an admitted applicant should examine when choosing which law school to attend? I always encourage students to visit a law school before deciding where to go. A school may look great on paper, but that does not mean it is the right school for you. Go and talk to current law students. Look for a commitment to academic excellence and intellectual rigor. Also, look for a place that feels supportive and pleasant – where people seem happy and the physical environment is going to facilitate rather than hinder your hard work as a law student. You want to find the right “fit” for you as a person and as a student. The heart of any law school is its faculty, so that should be an important factor in your decision, as well. Remember that the professors are more than just teachers – they are scholars and, if it is a solid law school, scholars with national, if not international, reputations. Look at their online biographies. Look at what the professors are doing and what they expect to do in the years ahead. How much are they publishing? Look carefully at the specific activities of each faculty member. In the legal world, the credibility of your law degree rests largely on the productivity and academic reputation of the faculty. The attrition rate is another thing to consider in choosing a law school. A high attrition rate will affect the stress-level of the student body. UC Davis admits excellent students and the excellence shows, with our attrition rate due to academic disqualification near 0%. We have an Academic Success Program that provides support and guidance to students from their first week in a law school until they pass the bar exam. TLS: Why do you think students should choose UC Davis over other top law schools, and UC Hastings in particular? UC Hastings is a solid school. UC Davis is excellent as well, but it is very different from almost any law school in the United States. One thing that sets us apart is our faculty, which is as productive as almost any law faculty in the country. Compare us to all of our competitors, including UC Hastings, and you will see that our faculty excels in scholarship. Unlike most schools, we have faculty excellence at all levels (senior and junior) and in all disciplines (business to immigration law). And we are accessible. Our research scholars also are committed to teaching and community. UC Davis is not a school where professors and students to go to class and immediately return home. It is a true intellectual and social community that is most visible throughout every day in the halls of Martin Luther King, Jr. Hall. Our physical setting is outstanding. Unlike many other law schools, we are connected to the larger campus of one of the nation’s top public research universities. (UC Davis ranks in the top 15 of all U.S. universities in research funding.). That means students have access to a myriad of intellectual and cultural opportunities available through UC Davis. Students often remark that the campus’s open space contributes to a relaxed environment that is conducive to learning. The proximity of UC Davis to Sacramento, California’s capital, as well as the San Francisco Bay Area, creates unparalleled opportunities for students. Those who are interested in the political and lawmaking process are able to work with the California Attorney General’s office, legislators, legislative committees, the governor’s office, or lobbyists. In 2010, the California Law Revision Commission, the research arm of the California Legislature, will move to UC Davis, creating many externship opportunities for law students. And those who want to spend time in San Francisco, Oakland, and Berkeley can easily do that. The Bay Area provides a wealth of opportunities in the private and nonprofit sectors. A number of students and faculty, especially those who are part of dual career households, live there. TLS: What do you feel are some of the strongest programs within King Hall? We are proud to boast exceptionally strong programs in business law, intellectual property, environmental law, public interest law (constitutional, civil rights, immigration), human rights and social justice, and international law. The faculty who are a part of these programs are widely regarded as being among the best legal scholars in the United States. The international and technological landscapes are changing fast. Intellectual Property and International Law are increasingly important in the global economy. UC Davis has an array of cutting edge scholars in these important fields. We work hard to make sure that King Hall is a leader in legal education. This past year, we unveiled the California International Law Center at King Hall (https://www.law.ucdavis.edu/academics-clinicals/cilc/index.html), which attempts to bring our wealth of faculty and student international programs and activities under one umbrella. Public interest law has long been a hallmark of UC Davis School of Law, ever since our founding 40 years ago, when our building was dedicated in honor of Dr. Martin Luther King, Jr., and his vision of social justice and public service. Our clinical legal education programs in civil rights, family law and domestic violence, and immigration law provide legal assistance to people most in need, many of whom otherwise would be without a lawyer. Students handle cases in court for clients. Students are able to apply the theoretical material they learn in class and do practical work, representing clients in court. We have as strong a group of clinical programs as any law school in California, perhaps the country. TLS: Since becoming Dean, what changes or developments within the law school are you particularly proud of? The entire King Hall community is thrilled about our exciting building expansion and renovation project. Our law school will soon occupy an expanded, state-of-the-art facility that will be spacious, comfortable, eye-catching, and accommodate the latest technology. To see the new wing of the building going up, check out our construction webcam at http://www.law.ucdavis.edu/alumni/giving/camera.html. My predecessor, Dean Rex Perschbacher, laid the groundwork for that project, and I am proud to bring his dream into being. Not only will the huge new wing, which is slated for completion in May 2010, look beautiful, but it will encourage circulation among students and create “social spaces” for them. The expansion is going to add great new reading rooms and classrooms, as well as a new appellate moot courtroom. We are currently scheduling oral arguments of the U.S. Court of Appeals for the Ninth Circuit, California Supreme Court, and California Court of Appeal in the new appellate moot courtroom. Also, the California Law Revision Commission, the independent research commission that analyzes and recommends legal reforms for state government, will be housed in our new wing, creating great research opportunities for faculty and students. I am excited about the addition of new faculty – Miguel Méndez and John Hunt are our two most recent hires. 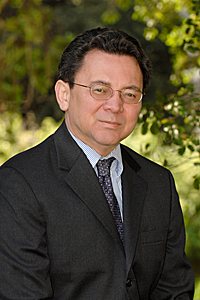 Professor Méndez was a chaired professor at Stanford Law School and is one of the foremost scholars in the field of evidence law. 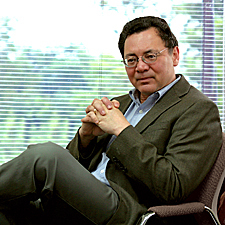 Professor Hunt, formerly the research director of the law and finance program at the Berkeley Center for Law, Business, and the Economy, is an expert in the regulation of financial markets and institutions, areas of study that are critically important in an era of the global financial crisis. The faculty as a whole is incredibly productive. And our marketing efforts have greatly improved the national and international exposure of the faculty. Indeed, as to the recent news coverage of Justice Sotomayor’s nomination to the U.S. Supreme Court, UC Davis law faculty appear to have been quoted as frequently as any law faculty in the country. Last year, C-SPAN covered the UC Davis Law Review symposium on Justice John Paul Stevens, who himself appeared by video. In recent months, faculty have published op/eds in the New York Times and Los Angeles Times and quoted in those newspapers as well as in the Washington Post, USA Today, Wall Street Journal, Financial Times, and La Opinion. I am also very proud of our commitment to diversity, and the positive relationship between students and faculty at UC Davis School of Law. A recent issue of National Jurist magazine praised King Hall as having one of the most diverse faculties of any American law school. We also ranked tenth in the country and first among California law schools for faculty diversity in Princeton Review's recent assessment of “Best Law Schools 2009.” King Hall also has more Asian American professors than any law school in the United States. In addition, we are home to Professor Cruz Reynoso, former Associate Justice of the California Supreme Court and the Latino civil rights icon of his generation. 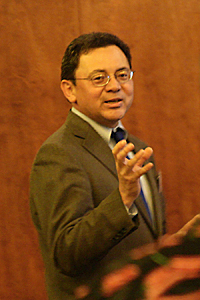 And, we have the first Latino dean of any professional school in the University of California system. TLS: Do you have any goals for the law school to achieve in the next 5 to 10 years – either large scale or small? Our main objective is to keep building on our excellence and to get the word out from those “in the know” to everyone. By many measures and in many ratings, we are regarded in the top 25 schools in the country. One goal would be to continue to improve the overall excellence of the intellectual quality and diversity of the student body and faculty. We want that to be obvious in any credible ranking. We want to be in a position to be consistently in the top 25 in all rankings, not just some. We also want to keep connecting our scholarly endeavors with the real world. It is our goal to produce scholarship and leaders for government, private and non-profit sectors and policymakers who can ably navigate this new challenging legal world. In essence, we aim to make a difference. TLS: Will the recent economic downturn greatly impact your goals? In a word, “No.” The economic downturn’s most immediate impact at the law school unfortunately is its effect on student fees. Fees have gone up at all law schools, including ours. As the beneficiary of a public university education, I recognize how hard we have to work to maintain a public legal education that is of the highest quality and accessible to students of all socioeconomic backgrounds. With the help of our growing alumni base, who donate generously to the school, as well as many other donors, we are quite confident that we can continue to uphold these ideals. We will always ensure that we have adequate resources to provide core services to our students. Furloughs of staff and faculty hurt. While seeking to retain faculty and staff, the School of Law is responding to budget cuts by reducing discretionary expenses, including travel. Please rest assured that the core of UC Davis School of Law remains strong. We must raise money for student scholarships so that we can compete for the best-and-brightest students. The School of Law must ensure that students can afford to attend UC Davis School of Law if they are admitted, whatever their economic circumstances. As for employment, our students continue to land jobs because they are talented and because they obtain a great education. Our Office of Career Services, with the help of faculty, administrators, alums, and friends, has been ratcheting up its efforts to support student jobseekers and increasing its outreach efforts in California and across the nation. This year, the number of employers who came to UC Davis did not drop as much as at other law schools. Our students and alums regularly secure jobs in Washington, D.C., New York City, Chicago, Atlanta, Denver, and Seattle, as well as cities throughout California. TLS: Are there any particular areas where you are looking to expand the faculty or curriculum at King Hall? Unlike many law schools, we will be searching to fill at least two faculty positions this year. When we consider where to expand faculty or curriculum, we ask ourselves where the future of law practice is heading, as well as our current curricular needs. Looking forward, I see international law, civil rights, corporate governance, sustainability, technology, climate change, and health law as cutting edge fields. We also must fill a few gaps in our core curriculum. So which programs might we step up in the future? We are rationalizing and expanding our global classroom through the California International Law Center at King Hall. In the near future, we hope to expand our environmental law, health law, and international programs, which would be a natural fit for the existing strengths of the larger campus at UC Davis. TLS: What are your thoughts on the U.S. News Law School Rankings? Virtually every law school dean loves to hate the U.S. News & World Report law school rankings. I can assure you that law school deans across the country dread the rankings released every April. At the same time, virtually every prospective applicant, student, faculty member, and alum look at them with great interest. We therefore cannot ignore the U.S. News rankings. Nor will we live or die by them. Any set of rankings that fluctuates a lot from year to year is open to skepticism. Frankly, schools don’t change that much year to year. But changes in the annual rankings do tend to boost interest in (and sales of) the law school rankings issue. So the parts of the U.S. News rankings that are the most stable – and thus the most reliable information for applicants to look at – are the peer assessment score (reputation among other schools’ deans and law professors), the assessment score by lawyers and judges, and student selectivity measures such as GPA, LSAT scores, and percentage of applicants accepted. These measures comprise 60% of the rankings, and they don’t change much year to year. They are the core of the U.S. News law school ranking system and the part that students should pay the most attention to. The peer assessment score is a leading indicator of a School’s overall reputation. Consumers of rankings would be well-advised to look at many different rankings rather than place too much emphasis on any particular one. Some are better than others, but no one ranking methodology is perfect. Nonetheless, we must note that we moved up significantly in last year’s U.S. News rankings (from #44 to #35), the largest jump of any law school in the top 50, and we hope and expect to move up again this year. Our goal, as I said previously, is to be in every rankings’ top 25 law schools. Importantly, we are in the US News top 25 by peer assessment and racial diversity of the student body, as well as in Brian Leiter’s scholarly productivity rankings. TLS: Can you speak about the clinical programs at your law school? We at UC Davis School of Law take a tremendous amount of pride in the great array of clinical experiences available to our law students. Our in-house clinics, which were among the first law school clinical programs in California, provide legal assistance in immigration law, civil rights, and family law and domestic violence. They are absolutely unrivaled. We also have a fully supervised externship program that allows students to earn academic credit for work in a number of legal settings. As an immigration law scholar, I have worked with our Immigration Clinic over the years and am often impressed by the quality of the students’ work as well as their heartfelt commitment to the clients. And the Clinic wins close to 100% of its cases! Unlike other law schools in which students work on appellate briefs, our clinical students work with real clients on real cases, making real differences in real lives. Students conduct trials in federal and state court as well as hearings in immigration court. They also argue appeals in the U.S. Court of Appeals for the Ninth Circuit, a great opportunity that many lawyers rarely get, if ever. Clinical legal education means more than just meeting with a client and going to court. Our supervising attorneys, besides doing excellent legal work, guide, instruct, and support students at every stage of the case. We ensure that students learn about the clients and communities they serve. Skilled clinical professors teach them the practical skills, as well as the law, necessary for them to become effective lawyers. One clinical student said recently that “you get to apply the theoretical material you learn in class. You apply it and make a difference in someone’s life, which is great.” A great example is a student who through our Family Protection and Legal Assistance Clinic, which is based in a small community near Davis, is able to help a battered woman to get a restraining order protecting her from her batterer. Equally important, our clinical programs serve as support networks for students who want to make a difference and serve their community. TLS: How does Law Review and other journal selection work at your law school? A student’s ability to serve on the UC Davis Law Review is determined by a write-on competition, as opposed to grade point average or faculty appointment. This year, Law Review members were chosen from a group of nearly 100 students who competed in a week-long competition, which tested their ability to write, comment, and accurately check citation forms. Membership for our remaining four student-run journals (Business Law Journal, Environs, Journal of International Law & Policy, and the Journal of Juvenile Law & Policy) is open to all King Hall students. Significant writing and editing experience is a plus. Members have to commit to a minimum number of hours of journal work each semester. Officers are elected by members of the respective journals. TLS: Currently, UC Davis School of Law and King Hall are names used inter-changeably. How do you feel that this impacts the “branding” of the law school and thus its reputation with potential applicants, especially out-of-state students who might not be familiar with the UC system? “Branding” is an important marketing device and a number of law schools, including UC Berkeley, for example, have tinkered with their “brand name” in recent years. It is important to emphasize, first of all, that UC Davis School of Law, like Berkeley, Irvine and L.A., is a full part of the UC system (UC Hastings operates independently of the main University system). The University of California is widely recognized as the best public university system in the world, and we are extremely proud to be a part of it. You will see both names, “UC Davis” and “King Hall,” on our website and in many of our publications. We are extremely proud of the person for whom our building was named, as well as proud to be part of UC Davis. “King Hall” reminds people of when we came into being, and what our ideals are. It is even a part of our mission statement: “We are dedicated to the ideals of social justice and equality espoused by Dr. Martin Luther King, Jr., to whom King Hall is dedicated, and to serving the greater good through law reform, community service, and other activities.” U.S. Supreme Court Chief Justice Earl Warren spoke at the dedication of King Hall’s building, voicing support for our special mission in 1969. Buildings on many university campuses—and increasing numbers of law schools are named for someone who donated a large amount of money. Our building is not named for a donor, but a historical figure—indeed, the civil rights icon of his generation--who stood for liberty and justice for all, and that means a lot to everyone from faculty and staff to students and alumni. TLS: What do you think students enjoy most about King Hall? Students at UC Davis School of Law simply like studying law here. They enjoy their classes and they enjoy each other. They like the intellectual seriousness of the place and the camaraderie with other students, faculty, and staff. Phrases that often come up when you talk to King Hall students and alums include: “intellectually rigorous,” “a sense of community,” “warm environment,” “accessible and open.” Talk to any alum of UC Davis School of Law and they will tell you about what I call the “King Hall difference,” a true law school community dedicated to excellence and support for students. Unlike the alums of many other law schools, UC Davis alums look back fondly on their days here. This makes my job as a dean reaching out to alumni much easier than if, as is the case at many law schools, the student experience was negative, and law school memories are as well. TLS: How is the law school adapting to the changing legal market? Will there be any changes to the OCI process or career services? At the ground level, we fully understand that assisting our students in garnering employment is the name of the game. The Career Services office is intensifying efforts to find jobs for our students. We have made it clear to employers who have chosen not to participate in our fall on-campus interview program that we are eager to accommodate them later in the year should their recruiting needs change. Resume collections and interviews continue to be scheduled throughout the year. In order to better prepare our students to find employment in these challenging economic times, we have also designed new programs, including: Expanding Your Geographic Horizons; Finding a Job in Difficult Times; Economics of Working in the Public Interest; King Hall LRAP & Public Interest Loan Forgiveness; Don’t Take It Personally (Disappointing Job Search Outcomes); Alternative Careers in Law; and Working as a Solo Practitioner. Networking workshops are being increased in number as well. To increase our students employment opportunities, I regularly meet with managing and hiring partners of law firms throughout the State and nation. I have tried to learn what law schools can do to improve and also try to convince them to interview our students. We have enjoyed success. Time and again, law firm leaders have told me that our law school, faculty, and students have a stellar national reputation. TLS: What do students typically do during their 1L and 2L summers? 1Ls have a full range of summer employment options available to them following their first year, in a variety of employment sectors (law firms, public interest, public sector, and judges’ chambers). Students also work for professors as research assistants. The main objective for the first summer is practical experience. Utilizing their newfound legal research and writing skills is key, and sharpening these skills is tantamount. The most popular summer option for a 2L, as is the case at most top law schools, is working at a law firm. In fact, many law firms use the 2L summer to recruit permanent talent. If 2Ls perform well during the summer months they may very well garner a permanent offer for post-graduate employment 9 months before they are to start! TLS: Can you describe the general culture of King Hall? The School of Law is truly committed to excellence. Small and supportive, with faculty who are nationally- and internationally-recognized scholars who are readily accessible and dedicated to teaching. Students who come to UC Davis School of Law soon realize that they have joined a true academic, intellectual, and social community. TLS: Can you offer any general advice to TLS members on succeeding in the law school application process, while in law school, and in their legal careers? Success in the law school admission process is much easier if you create a solid foundation for your success as an undergraduate. So if you’re considering law school, maximize your grades and LSAT score. Hone your reading and writing skills. Learn what law school and legal practice are about. If you have the chance, work or volunteer in a legal setting so you have an idea of what you’re getting into – and whether it might be a good career fit for you. Go to class. Have an open mind. Work hard—really hard. But, try to achieve some balance between school and life. Act professionally and ethically at all times. Keep in mind that the relationships that you establish with faculty, students, staff, and administrators will be with you throughout your legal careers – the impressions that you leave are important ones that will follow you professionally. The importance of professionalism and ethics has come up often in my discussions this summer with the managing partners of major law firms. Partners and recruiters were impressed with new associates’ enthusiasm and intelligence. In their view, some junior associates, however, make a bad impression when they failed to dress professionally, engaged in personal internet use (including Facebook, e-mails, and text messages) on firm time, and did not accept constructive criticism well. My advice? Be professional at all times. Stay positive. Respect the law firm’s rules. Take constructive criticism and learn from it. TLS: How do you feel that the new law school at UC Irvine is going to impact King Hall? Will it siphon off traditional “Davis/Hastings” graduates, potentially causing a drop in yield and lower GPA/LSAT medians and, thus, a drop in U.S. News rankings? I am pleased to see another public law school in California. We hope that it proves to be another UC school with which we can partner in important ways. It is much too early to tell if a new school will have any impact on admissions at King Hall, but so far I don’t think it has. UC Irvine enrolled its first class this month and our LSAT median increased for the entering class in Fall 2009. We also generally have more diversity among our student body than any other UC law school. TLS: What impact do the continuing disasters with the California budget have on King Hall? How does the law school plan to mitigate harmful impacts of future budget crises? The ever-tight budget hurts, but we are surviving. Like everybody else in California, we have to be smart about how we spend our limited–and, in some instances, reduced--resources. Times are hard (with furloughs imposed by the University of California) but we have no layoffs anticipated. We in fact are filling two faculty positions next year and a number of open staff positions as well. We are making every effort to continue providing core services to our students. We are still able to maintain a very favorable student/faculty ratio (12:1). We have a strong commitment to providing technological resources and support. Our students receive a generous free printing allotment and free licenses for popular Microsoft products such as Microsoft Office and Windows. I well know that private fundraising is increasingly important. That is why I am often on the road, just a few weeks ago meeting the Chief Executive Officer of Walt Disney Corp. and another night attending a bar association reception in San Francisco. Despite the challenging economic climate, last year was the second-most successful fundraising year in the law school’s history. At 40 years, we are a relatively young school, but I am gratified to see our fundraising success continue as our alumni base matures. The support of alumni, faculty, staff, students, and friends helps to fund scholarships, activities, and programs to keep King Hall competitive and strong. Last year, a $1 million gift from a foundation named our new appellate moot courtroom. This summer, another foundation pledged another $250,000 to our renovation project. Our new chancellor, Linda Katehi, fully appreciates that the law school is an integral part of the bright future of the UC Davis campus. On her first day at work earlier this month, the Chancellor attended a meeting of the law school’s alumni board, toured the building project, and greeted new 1Ls at the law school’s welcome barbecue. Immediately after the meal, she hopped on a red-eye flight to Washington, D.C. for a meeting with Secretary of State Hillary Rodham Clinton! Chancellor Katehi’s decision to visit the law school in her first act as Chancellor shows how committed she is to the School of Law. TLS: King Hall has a reputation for being a strong school for students with an interest in public interest law. Can you explain why this is the case and what opportunities exist at UCD for such students? UC Davis has a strong reputation for intellectual rigor. Housed in Martin Luther King, Jr. Hall, it is a natural place for people who want to learn from the best about how to change the world. As for opportunities that attract public-spirited students, there may be too many to list! Each year, we offer two large ($20,000) Martin Luther King Jr. scholarships to students interested in pursuing public interest law and whose life has reflected the principles of Dr. King. I have already mentioned the law school’s great clinical programs. We also offer unrivaled opportunities for externships, thanks to our proximity to Sacramento (just a 20 minute drive from Davis), the public policy capital of the seventh largest economy in the world. We’re also only about an hour drive from the San Francisco Bay Area, which is the world’s incubator for progressive social and legal thinking and policies. In addition to clinics and externships, the law school offers a Public Service Law Certificate Program, which was developed for students seeking public service careers. We celebrate the awarding of the certificates to third-year students at the annual Public Service Graduation ceremony. Likewise, the school’s Pro Bono Program is designed to enhance students’ educational process. Students volunteer in public interest organizations, government agencies, and courts. The law school recently expanded its Loan Repayment Assistance Program (LRAP) for law graduates who pursue careers in public interest law. Increasing debt-loads have made it difficult for some students to pursue a career in public interest law. Our LRAP program is more generous than any other in the UC system. Unlike many similar programs, for example, LRAP offers repayment assistance for not only law school debt but also loans received for undergraduate and other graduate-level study. Our public interest law program is exceptionally strong, but please do not forget our strength in business law, business associations, securities regulation, and corporate governance and among the strengths of our business law curriculum. 53% of the graduating class in 2008 went on to private practice – that’s a statistic that compares favorably to law schools in big cities. There is no shortage of UC Davis School of Law alums who get great jobs at large, prestigious firms. Please visit our website (www.law.ucdavis.edu) to see the biographies of some of our alums.